Regular Rate $1397 . Today Only $499! The Sandos Caracol Eco-Resort & Spa strives to be the number one eco-hotel in the Mayan Riviera. Not only by highlighting its natural beauty, such as its many cenotes, mangroves and regional animals. But also through constant innovation and projects, emphasizing the conservation of the environment and the awareness-raising of the public. The Sandos Caracol Resort is perfectly integrated in its natural surroundings and it's stunning beaches stretch for miles and offer the perfect opportunity for scuba diving (with a huge variety of colorful fish). Enjoy our huge moder spa that includes a sauna and thermal bath circuit. Also take advantage of our fully equipped gym with classes including yoga, spinning, Tai Chi and Pilates. The Sandos Caracol Resort is the perfect hideaway for your Mexican vacation! Ultimate Eco Resort Experience Perfect Blend of Culture, Environment and Recreation. 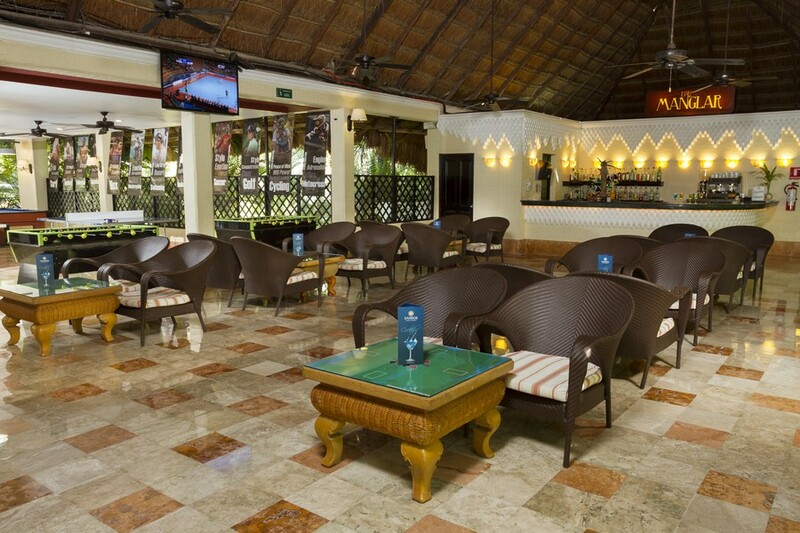 Sandos Caracol Eco Resort & Spa All Inclusive Sits on a Private Beach in Playa del Carmen. 6 All Inclusive Restaurants, Swim Up Pool Bars, Aqua Park, Kids Club, and Live Themed Shows. We have just returned from the Sandos and can honestly say it was the best holiday we have ever had. 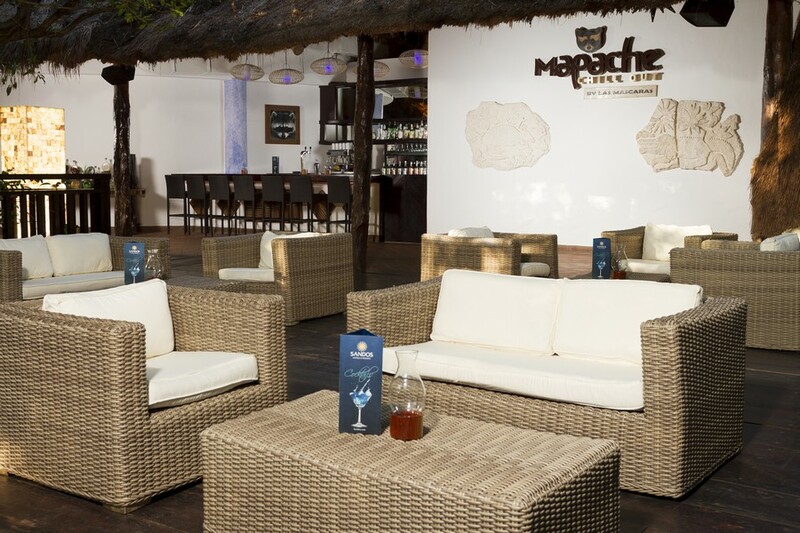 The facilities are first class with the choice of 7 different restaurants with excellent quality food. The staff are lovely and cannot do enough for you, always smiling. The beach is perfect! We Renewed our Vows whilst we were there and Maurichio the Co-Ordinator gave us a fantastic experience which we will remember forever, married right on the beach. Escape to an array of beautifully appointed guest rooms stretching from the pristine white sand beach to the lush green jungles of the Riviera Maya. Elegant accommodations with Private Balcony or Terrace! In Room Amenities: Air conditioning, Ceiling fan, Satellite color TV, Radio alarm clock, Telephone, Minibar with mineral water, soft drinks and beers (replenished every 2 days) and safe deposit box ($). All meals (buffet breakfast, buffet lunch and buffet dinner), snacks and dinner in the specialty A la carte restaurants. Unlimited national and imported drinks, including in the Disco. Drinks available on the complex 24 hours a day. 5 Restaurants including 4 a la Carte. 8 Bars including 1 Swim up bar, 1 Sports Bar and 1 Snack Bar. AQUA PARK for children with 17 slides and water games. Activity program with a team of entertainers: guided walks, darts, petanque, table tennis, dance classes, billiards, football, basketball, aerobics, beach activities. Pool games and water aerobics. Water polo. Beach volleyball and water volleyball. Snorkelling gear and introductory Scuba Diving lesson in pool. Tennis (unlimited use of courts during opening hours). Includes use of equipment (balls and rackets); appropriate attire required. Gym: free use of exercise equipment, sauna, steam room and jacuzzi. Baby Club (2-3 Years old), Mini Club (4-7 Years old), Kids Club (8-12 Years old) and Teens activities (13-17 Years old). Tennis (unlimited day and night use within schedule of operation, on a first come first served basis). Includes equipment (balls and rackets), proper attire and court shoes required. It's a scientific fact that vacation calories don't count! 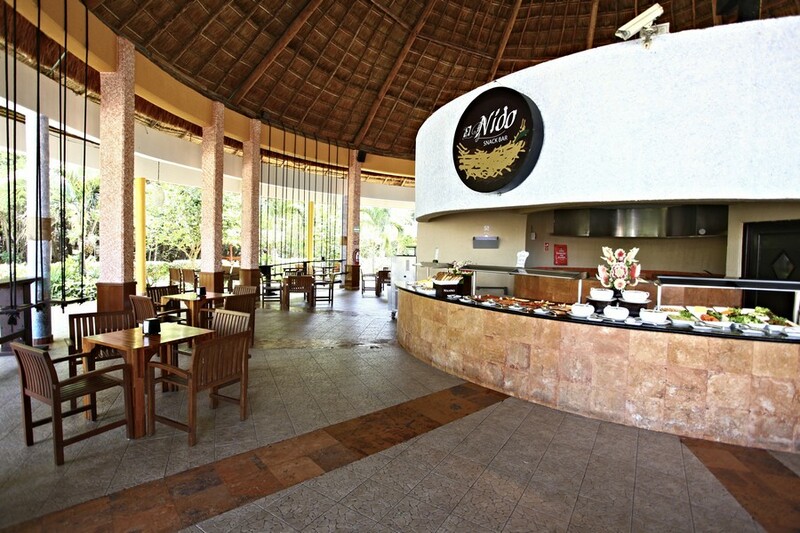 Indulge in our wide range of buffet, a la carte and snack bar options here in paradise. 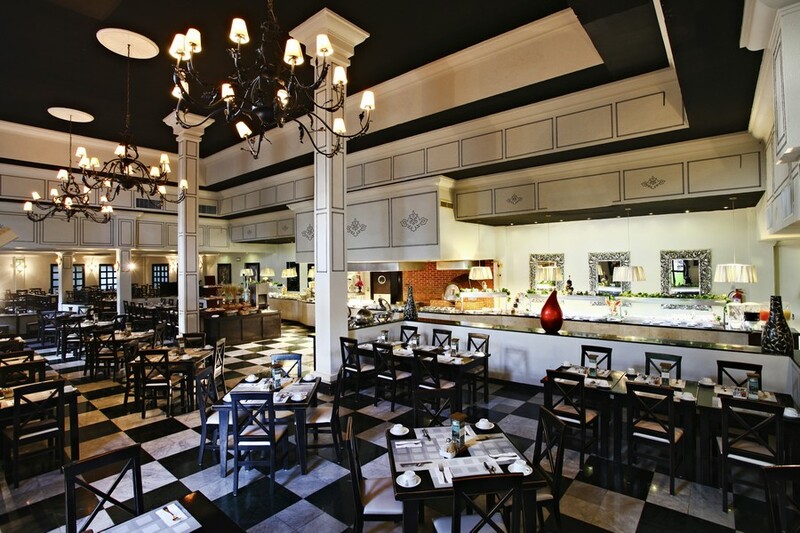 Buffet that offers delicious Italian specialties. At Buffet offers delicious Mexican specialties. International Buffet open for breakfast, lunch and dinner. Mediterranean specialty restaurant with a la carte service and salad bar. Oriental cuisine and teppanyaki, with a la carte service. Brazilian Specialty Restaurant with A La Carte service. 24 Hour Snack bar located in the center of the Resort. We are having a great time thanks to BookVIP. Make sure you go online and check them out. We are here in Sandos Caracol thanks to BookVIP. We have had a great experience. This is a beautiful resort with lots of fun stuff to do like catamarans, parasailing and just a great memory created for us through BookVIP. "Great Holiday Resort, Rooms, Food,and Staff"
We stayed at this resort from 28 November to 8 December. Everything about this hotel is very good only just short of excellence. When we arrived we were greeted by checking the staff were very helpful in explaining all the details about our stay, our all-inclusive offer as well as details of how to get around the site. We stayed in a deluxe room and I have to say it was brilliant it was very spacious plenty of room large bed, double sink, air conditioning and a large Jacuzzi hot tub! The rooms were cleaned excellently everyday, the cleaner was very helpful speaking good English. There are a number of restaurants all serving various food and the quality was very good in every restaurant and the choice you get in each restaurants as well as the continuous replenishment of the food being served. All the staff and chefs in the restaurants are really helpful in terms of advising on alternatives or choices if there was something we may have wanted or were looking for. Everywhere we encountered staff they were all very helpful, service with a smile every single day. They all spoke very good English and there are always willing to lend a hand in any way shape or form and give advice on where to go what to do, and we just never experienced the staff so friendly in one resort and for it to be so genuine and rather than put on. In terms of the activities that place was massive and the adults only section was brilliant escape just to get a breakaway from children. The pool was very big but it did sometimes get very busy but the beach was just so close it didn't make a difference and there is a separate pool in adults only section. There was always enough loungers to find sun anytime. The sports bar showed various sports and even some of the English football when it was on which was good and there was pool tables and other entertainment. The Spa was very nice and clean. The entertainment in the evenings was a very good, particularly the live shows done by the staff the two Mayan shows and the Michael Jackson shows were excellent and not to missed. Wi-Fi worked perfectly in the designated areas without any fails and this was particularly good to stay in touch with news family/friends etc. All in all a very good resort, excellent helpful staff, good food and I would not hesitate to recommend this hotel and resort to other people as well as returning there again one day with my wife for a holiday. "aprovechar el da ~ seize the day"
"Great yoga classes, plus sport activities for all the family"
We have stayed at several all-inclusive resorts in the area, and Sandos Caracol is our favorite! I often feel that the all-inclusives can be a bit 'tacky', and too 'Micky Mouse-ish', if you know what I mean. Sandos Caracol didn't feel like that. The sport options were plentiful. Our kids played beach volleyball for most of the day, followed by soccer at 4pm, followed by some tennis, and sometimes mixed up with some golf (the Nick Price course is great!) My husband would go to the driving range every day, and I would start my day with yoga. The yoga teacher Juan Carlos is amazing! Unlike most other resorts, where the yoga classes are rather pathetic, this is a real full-on Ashtanga yoga work-out. Beginners can enjoy the multi-level class as well, but if you are into your yoga, you will still feel that you have learned a lot in the space of just a few days. The Zumba and bootcamp sessions are okay, nothing amazing though. And they are only 1/2 hour. The food at the resort is incredible. I didn't even bother eating any meat, as the vegetarian options were so fantastic and plentiful. You can also have fruit & vegetable juices made freshly for you throughout the day. The sports bar is fun with table tennis, fussball tables, chess, air hockey, etc. This was our first holiday to Mexico and I am so pleased we picked this hotel. It was absolutely wonderful. All the staff were always very friendly and polite. Especially Lydia in the Main restaurant was very helpful. The hotel room was nice and spacious, the layout of the hotel grounds was interesting, lots of greenery, we were enchanted by all the animals walking around freely in the grounds. The drinks service around the pool was again superb. There are several restaurants to choose from and all were excellent. We definitely will come back to this hotel. We went to Sandos Caracol in December 2013 for one week. We loved the location of the hotel on a nice beach and surrounded by the jungle. There were also some Maya ruins and several cenotes around the hotel, along with two which you could swim in. The employees in the hotel were exceptional. They were very friendly and always polite to us. We like that they really try to make this hotel eco friendly. Solar panels, powering golf carts by the renewable energy and eco water treatment plant are some of the initiatives they are working on. We took part in the hotel's eco tour and Naomi was our guide. She was very knowledgeable and helpful. You could tell she was very passionate about her job and even took us out on a private tour. Naomi was able to relay her knowledge and passion to us. If you are a couple, dont forget to book free romantic gondola tour (Champagne included). If you need the Internet they have it free in the most common areas and the speed is decent. We were able to Skype with no problems. "The best of the best!" Words could never do this resort justice! We stayed at Sandos Caracol for a family getaway and our wedding celebration. The grounds, amenities, pools, and beach are absolutely outstanding! There is a 200 year old cenote and gorgeous, natural surroundings. A wedding photographer's dream! Upon arrival, the staff was attentive, engaged, caring, and willing to take care of every request and question we had. One in particular, Isobel, guest services manager, was like a divine gift... a magician... the welcomed smile of relief throughout our stay. I needed my wedding dress steamed and she walked to the ends of the earth to make it happen. We didn't have a place to eat dinner and celebrate after our wedding, she went above and beyond to produce an experience that could only be described as a dream! We had a private dinner on the beach in the most magical structure on the resort. Again, the service was incredible and the food was delicious. During a week when surely all the staff at the resort would have rather been with the people they love, they were attentive, kind, loving, engaging and excited about spending their holiday with us. For us, that meant the world! Thank you Isobel and the Sandos Caracol team for making our wedding celebration and week with our family the most wonderful time of our lives! We will absolutely be visiting again - hopefully very soon! 8 members of our family (from Vancouver, Toronto and Ottawa) met at Sandos Eco Caracol for Christmas this year. There were 3 kids and 5 adults - and we ALL had an incredible time. Our kids loved everything about the resort - the kids club was incredible, the evening shows were entertaining (especially the Disney show and the Magic show! ), the nature walks were awesome and the pools, ocean and all the nature were awesome for the kids. The adults had an equally great time - awesome pools, lots of great food and drinks and fun activities (the mechanical bull was a favourite!) The staff were so lovely - everyone was so friendly and eager to help out with anything we needed. The Christmas eve dinner was incredible - so much delicious food and gorgeous decorations - they really put on a show for the guests. A few of our favourite things about the resort: -Bernardo at the "Tortuga" pool made our last day an awesome one with great drinks and fun -the photographers took some amazing family photos for us that will make for great memories for years to come -the snorkeling in the natural "lake" was so cool for our 6-year old son -the swings at the snack bar were a huge hit with our kids - we spent hours on them! -my mother-in-law and I both had the best massages of our lives at the spa! Pedro is amazing! Our 1st time in a beach resort. Stayed in room 2004 in building 20 overlooking the beach. Nice view. Room size is ok but we hardly were in the room. Bathroom is very nice and spacious. Water filter in the room is a nice addition. Phone, internet, hair dryer, etc available in the room. Bell boys are very helpful. Busy reception area in spite of 8-10 receptionist probably due to holiday season. Lots and lots of activities in the resort. Aqua park was our favorite. Kids club is alright for under 4/5 but older kids get bored. Snack bars have good selection of desserts and food. Racoon often spotted in eating area and try to eat on leftover foods on unoccupied tables. Beds by the beach for couples seemed very romantic. "Love it so much, we bought for 30 years!" Great resort. Kids will love it, food was great, beach we good and service was incredible. We enjoyed ourselves so much we're going back in 2 weeks and bought a membership for the next 30 years. We've are well travelled and found Sandos Eco staff to be some of the best. "Perfect for families with young kids"
Had stayed at the resort for a week as apart of the All inclusive package booked through Sunwing. We were 3 adults , 1 five Year old and 1 Infant. Here are my observations 1. Property/Room - the property is built on a Mangrove forest. The buildings , trails , walkways etc are built around the forest. 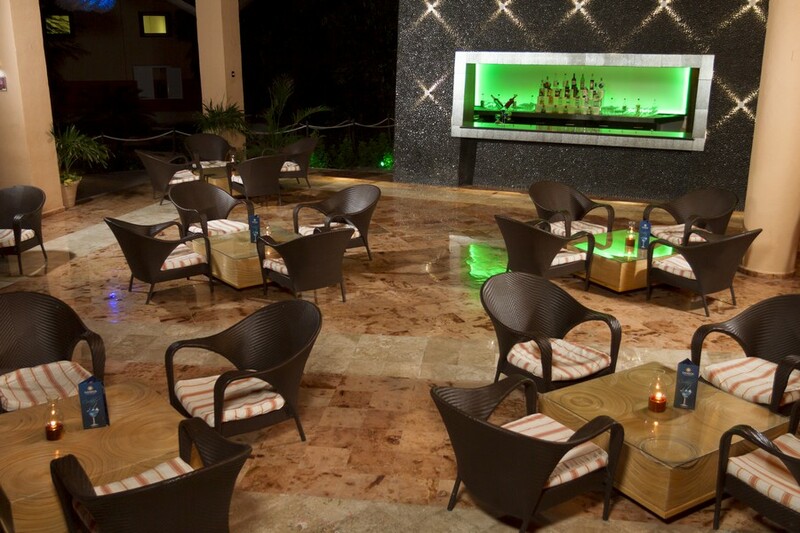 The setting for a few of the hang out places in the property are fantastic. We had booked a basic room as part of the package and found it to be decent(not great). 2.Facilities - The property has an Aqua park with a few slides which my 5 year old thoroughly enjoyed. He spent at least 1 - 2 hours everyday enjoying the kids pool / slides in there. The adult pool was also pretty decent in size. Did not feel overly crowded. The beach had a lot of rocks when you step foot into the water, but once you get past them you get into an area where fishes literally come close to your feet. The facility also has a fantastic "Cenote" where you can snorkel and see turtles and fishes. (make sure you take your snorkeling gear with you as the resort only provides you a glass). 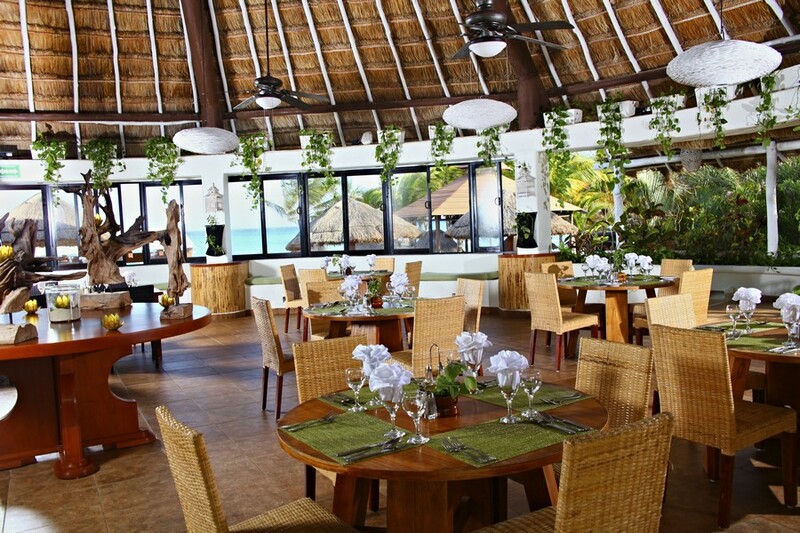 3.Gastronomy - There are 3 buffet restaurants One mexican , one international and one Italian available to eat. Being vegetarians we found the Italian and Mexican to be perfect places to eat our Lunch and Dinners respectively. You also get to eat in your choice in a specialty restaurant(steak , Mediterranean , Japanese) depending on your length of stay. We tried the Vegetarian one and found that the Mexican buffet was much better to our liking. There is also a Snack bar that serves snacks 24 hrs (Burgers , fries etc). There were Churros being friend and served fresh at the snackbar a few of the evenings. Overall we ate to our hearts content at all the restaurants. 4.Entertainment for the Kids - There were 2 good shows in the evening for kids . One was a disney based show and another was a superhero based show. My son thoroughly enjoyed both these shows. There were also activities like Mini Disco , Games , Pinata breaking etc for the Kids. The Kids club was pretty decent and kept my son entertained (We used to drop him off for a couple of hours) . I would highly recommend this place for Families with Kids . The two main reasons we (a young couple) would recommend Sandos Caracol are the hotel's nature surroundings and staff. We are nature lovers and the surroundings of hotel - mangroves, ruins, the beach and the hidden walking trails, made our stay in such a big complex very pleasant. The animals, wild and domesticated, who share the hotel grounds with guests and staff, are a joy to watch. It seems that the hotel takes good care of all of them, and tries its best to educate the guests not to feed the wild animals (in particularly the racoons). The second reason, the staff - friendly, professional, hard working and proud of what they do! In the hospitality industry its all about the service, and the staff at Sandos Caracol, from catering and house keeping to the front desk and customer service, did an excellent job, always with a smile, positive attitude and personal approach. "Can't be topped for young kids"
So much for all, especially kids...aqua park, snorkelling in cenote, good area of sandy beach with some fish, well equipped and well supervised kids babysitting area...they loved the swings to sit on in the snack bar. Entertainment excellent..none of those audience participation game shows. The Michael Jackson show was great, as was the Disney show and Superheroes. Seeing all the animals and recycling, composting areas was a bonus. I liked the fact that music in the pool area was quite subdued...in fact there was no loud music anywhere. Seemed prepared for the odd day of torrential rain ..added indoor entertainment and snacks. Restaurants good but we could have had a bad situation when the chef in the Japanese restaurant lost control of his knife tossing and broke one water glass showering one of us with water. Staff were great part from one who told us it was beyond their control to have the whole family in the same building..someone else immediately countered this and had us all together. And a light in our room was never fixed but no big deal. Had a doctor on site.. He gave us instant and good attention when one child had to go to hospital for stitches...just as we were leaving!! "Looking forward to our return"
"Great place to bring your kids or grandkids"
Wow!!!! what a beautiful resort geared up to entertain everyone. We went at Xmas with my daughter and granddaughter for a week. Lots of wildlife on the resort. beautiful waterpark and a kid club for the kids. Santa brought gifts to all the kids on the resort. It was nice of the management to do this. The room was excellent, the food great, lots of a la carte restaurant, 24 hours food and beverage. I will return with the other grandchildren one year. A big thanks to all the staff at this resort, they will do everything to make sure that your stay is enjoyable. also a big thanks to the management, you have a well run hotel. "The staff make this resort!" The natural and cultural aspects of the resort was unique! The beach is pretty good, the food is ok but the service was FANTASTIC! Go see Pedro at the main pool bar! He's great! Juana at the main pool bar will remember your name and always says hello! Rubicel, Sala and Elidan at The select club bar were fantastic!!! Claudia on the select club beach was also a great server! It was too bad she wasn't serving on the beach our entire trip. Our favourite had to be Emma! We first met her filling in for someone's break at the select club beach! She was the first server to do more than just take our drink order...she had personality! We followed her the next day to the pool bar, then to La Jungla and tried to visit her everyday because she is probably the best server we have ever had! It was nice to have the same staff each day for the last few days of our trip so we could get to know them a bit! It made those days much more enjoyable! My one complaint would be that the staff are shuttled around to different areas each day so you don't get the same people everyday. From November 30 to December 6, our family of five, two parents, two boys aged 3 and 4 and one grandmother a.k.a. Grandar, returned to Sandos for a second time. Initially, we had a few issues with our room; however, once they were brought to the attention of the hotel, the problems were promptly rectified. Thanks Isobel! The rather chilly cenote was ameliorated by the warm welcome given to us by Rufo, Guardian of the Cenote. The food was very tasty and there were lots of choices, even for fussy eaters. We had notified the hotel in advance that my daughter would be celebrating her birthday there and they made it a night to remember! The hotel arranged a reservation at the steak house and had a mariachi band come to our table to serenade her. Much to the delight of the boys, their mother was provided with a goofy hat and a delicious slice of birthday cake; big enough to share. It was a wonderful birthday party for her and the rest of us! Each day we alternated between the pool, the Aqua Park for the kids and the ocean. The adults took turns using the spa on a daily basis; very relaxing. We found Sandos to be extremely family friendly. We all had a fabulous time and would definitely return. The only problem was our three year old who vehemently refused to leave Mexico. It took a lot of coaxing and cajoling to get him back on the plane bound for Winterpeg! This was out first trip to Mexico with our 2 year old son. We arrived on Sunday and got married midweek. This holiday over exceeded our expectations!!!!! Thanks firstly to our amazing and very kind wedding planner Fernandez and Marina!! All the staff at the Elephant bar for the excellent service. Antonia and the amazing ladies at the Laguna buffet and the very talented Laura at the salon! Wonderful, gorgeous, and we will be back in the next year!! Thank you! Thank you! Thank you! This was our second time in Mexico and we enjoyed every moment of it. Staff works really hard to ensure the grounds are always clean and all visitors are happy. For such a big resort, most of the employees we have talked to really care and want to make your stay a special one, our favourites: Margarita at the concierge thank you for the a la carte recommendations, Pascual at the front desk thank you for helping us with the problem in the room, Rufo thank you for your care for the cenote sharing your knowledge, Grey in the Select restaurant thank you for sharing your eternal smile, Nicki thank you for being there all the time when we needed help, and always with the same energy, wonderful, you and your team do an amazing job! Do not feed the animals, enjoy the wildlife. This year on vacation we were with a party of 10 people some family and friends. We purchased the Sandos Royal elite ownership around 6 years ago to be able to have everyone come with us and enjoy the special amentities. It has been worth it for us and We all had a great time plenty of good food, tasty drinks and top of the line staff. The way the resort is managed and the attention to the details have really went a long way. We are grateful that we are able to enjoy, share Sandos Caracol every year as it is never disappointing. Check in was efficient and all rooms were perfect. The housekeeping did special touches everyday and cleaned very well. Always had plenty of supplies towels, soaps and all the extras bathrobes, umbrella. We come to Mexico to have fun and did so many many thanks to the bartenders Oscar, Elidan, and Elmer they were on top of getting everyone drinks that were very made right. Then the beach waitresses Martha and Guadalupe were hard workers as well always taking care of what needed done to keep a bar clean and efficient. Highly recommend the romantic dinner on the beach was the biggest lobster I had ever seen was very romantic. Miguel and the other guy forgot his name it was on Dec 17 did so good and made our last night special the wait staff at the La Riviera was so good for the group dinner there as well. For the steakhouse Los Lorios want to thank Lantonio he has always been our favorite waiter. The new El templo Japanese was great Jose was a great chef. The Brazilian gets extra stars as they were so pleasant and just great dinner and service there for the lunch and dinner. Had breakfast at the Royal elite area inside and outside was really good there to have a la carte. Some other people throughout the resort that we enjoyed the company were Isidro Reyes, Yovani, Vicki, Yeni, Irving, Naomio, Juan hose, Lorenzo, Jose Elidos, Patricia, Landy. The beach cleaning crew are always making sure it is top shape so thanks to each one of those people for keeping our favorite part perfect. This resort has a lot to offer besides just eating and drinking there are natural myan ruins throughout the trails in the jungle it is call Xcaloco at the resort. The fire of life show is awesome. Plenty of trails for running and then you can rent bikes from resort and explore the jungle. There are tons of workers always working on keeping up the grounds tons of flowers and so much too see just so many plants and other cenotes throughout the resort. There is a cenote that you can snorkel in it is fresh water and can see fish. The beach is a bit rough in some areas stay away from them and stay in safe areas great for snorkeling but be careful and pay attention to where you walk and will be fine, plenty of smooth areas as well. They have a nursery to grow new plants and the palm trees on beach we love. There are tons of other animals there at the resort to check out. Juan Carlos the Yoga instructor did a great job of being inspirational and making me get some detoxification and work out. We were grateful to the workers there and they were grateful of tips as well. Had a blast at the disco a couple of nights dancing. Overall a great resort to stay at and we will return ourselves thanks to everyone there doing such a wonderful job. There is so much to see and do at Sandos Caracol Resort. This resort is fantastic. Great for families, seniors, and couples. The people that work at this resort are so friendly and helpful. Nuribe Paz was the first person we met. He took our luggage to our room and helped us when we needed a taxi to go into town. He also helped us greatly on our departure day. He made us feel special and by the end of the week we considered him our friend. On this resort you MUST go on the Eco and Cenote tours given by Noemi. This young lady is so nice and amazing. Noemi has so much knowledge about the trees, plants, and animals that surround this huge resort. Her tours will walk you through mangroves, a jungle, and teach you about five different cenotes that are on the resort. You can also swim in one of the cenotes. Noemis tours are unforgettable experiences with nature. We will never forget her. Another wonderful experience we will never forget is the romantic boat ride given by Jesus. It was a very relaxing, enjoyable little boat ride, through a jungle complete with distant music to set the atmosphere. There was also a nice bottle of champagne and chocolate covered strawberries included with this ride which was free. Jesus dressed for the occasion to make it so special. You will truly love this. Aaron took care of us at the bicycle center. He was getting ready to start a small tour when we showed up and he invited us to come along. The bicycles were in very good condition and the tour was quite fun. The nightly shows were very enjoyable. We were entertained by a good variety of very talented people. Amazing dancers, costumes and performances. The best shows we have ever pesonally seen. The food was very good. The Italian restaurant was our favorite. The beach was a little disappointing because of the rocks in the water. There were a couple of smooth spots in the water but the pools made up for this. There was a jet spa pool that was our favorite. We were in it everyday. Our room was beautiful and clean every day. We had a fridge in our room that was always topped up with beer, pop, juice, chips and chocolate, everyday. We also had drinking water and coffee or tea if we wanted it. Our maid Celeni surprised us everyday with animals made from the towels. To sum it all up we will definitely return . We just cant stop talking about it. Thank-You to everyone who helped us and we are sorry if you were not mentioned as we forgot some names. To the manager of this resort, you have amazingly wonderful people that work for you. Every single person we met went out of there way for us. Thank-You for making us feel special. God bless all of you!!!!! "A peice of Mexican heaven"
Me and my friend travelled in November 2013 and this was our second time at this outstanding hotel, although not our second time in Mexico, but we chose to return to this hotel as it offers everything a traveller to Mexico could ever wish for, which is why returned. From check in to check out (which for the second time left us in floods of tears because we never want to leave)we were not disappointed yet again. The grounds are amazing and maintained to the highest of standards to include the most friendly and dedicated man who sits in his boat and keeps the lagoons exceptional. The animals are amazing and the monkey's visited our balcony every morning and as an animal lover it was an amazing treat to be honoured with their presence. Sandos is filled with rich Mexican culture to include there own ruins so to be honest you don't need to leave grounds as there's that much to do. The food is outstanding with a vast choice for all tastes. The restaurants are exceptional with very efficient and dedicated staff, even the buffet restaurants is a treat who's staff made every visit a pleasure, but I must praise the steak house as not only will the food take your breath away, the whole building is a work of sophisticated class. The animation team headed by the 'ROCK' to include the most friendly and talented people, Blass, Noah, Roberto and Melicia and all off the team who I have not named will entertain you with the most wonderful shows and they will have you laughing with joy for your whole stay. The bar staff are quick, friendly and very helpful to include the most wonderful man Gasper who always had my favourite drink ready when he saw me walking over to the pool bar. We have stayed in some hotels in Mexico whereby you cannot get served unless you are flashing the tip money, Sandos is not like this as not all cultures around the world have the tipping culture so this is not expected by there guest which is very nice to see. Our rooms were kept outstanding by the cleaning staff who always had a big smile on their faces even when faced with the mess we sometimes left. Our holiday was made even more special by the most wonderful, caring and dedicated member of staff they have, who now we have the great pleasure of calling a friend, Nora their Chief Concierge who could not do enough to make an already special holiday OUTSTANDING & AMAZING. We see Sandos and all of it's staff as one big happy family to include all of there guest. Thank you Sandos for our little piece of Mexican heaven and taking us to your hearts....We are already planning our return, love to you all room 221 Sharon & Lindsay p.s I'm sorry their isn't a 6th box to put Sandos in because you are a very special and unique hotel. Regular Rate $ 1397 . Today Only $499!